We have added a couple of new options to the pricing page. New users now have the option of choosing between the existing Premium Online plan, or the new Guided Plan. 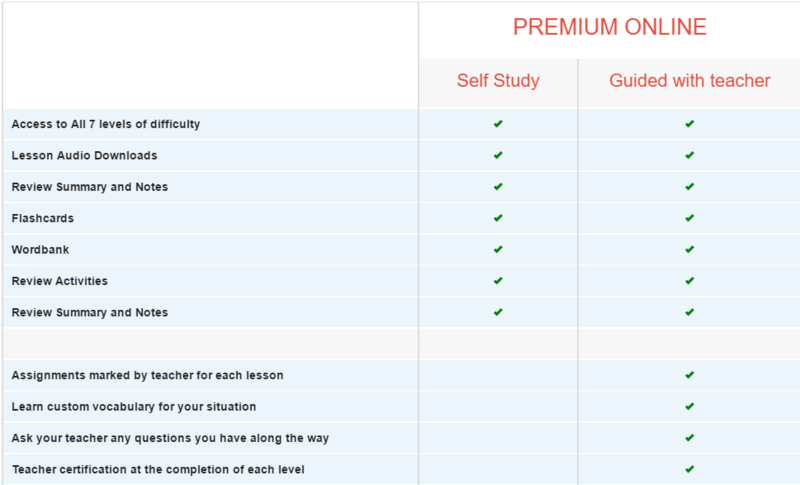 In addition to all the features from the regular online plan, the guided plan also provides an assignment for each lesson. This usually requires you to record yourself answering a question related to the lesson. If you require additional or customized vocabulary not taught in the lesson, you can ask the teacher who will provide an answer within 1 business day. 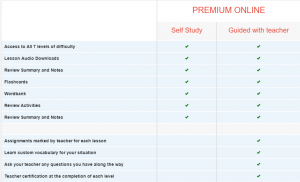 The guided plan also includes a level certification test for levels 1, 2 and 3. This consists of two parts. Part 1 is a timed online vocabulary test to see if you can identify vocabulary taught from lessons in your selected level. 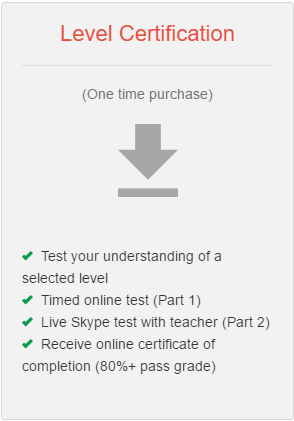 If you pass this test (80% or higher score), you then qualify for an online Skype test with one of our teachers. We have prepared a set of questions for each of levels 1, 2 and 3. If the teacher is satisfied with your answers (passing score of 80% or higher) then you receive your certificate, which can be printed out. Existing users can only purchase level certification tests for levels 1, 2 and 3. In the coming days, we will also add level certification options to the redeem credits program.